In December 2018, CNN International’s program Inside Africa explored the people and powerful impact of FilmAid Kenya’s Media Entrepreneurship Training courses in Dadaab and Kakuma Refugee Camp. FilmAid Kenya’s training course consists of a 12 month period of course work and practical training, serving 80-120 youth every year. Students gain skills in film, photography, journalism, radio, digital media and entrepreneurship, allowing them to access the invaluable creative and technical skills needed to explore issues within their communities and to express themselves creatively. For the past 12 years, FilmAid Kenya has hosted a film festival that showcases the students’ work alongside international features and shorts by, or about, refugees and other displaced people. In this episode, CNN Inside Africa follows FilmAid’s students and graduates as they take their filmmaking journey from inspiration to exhibition. Along the journey you will meet some extra special FilmAid graduates - the dynamic duo Amina Rwimo and Abdul Patient, founders of the production studio Exile Key Films - during the making of the Sukar Music Video by artists Mercy Akuot & Scoobylincos. Amina and Abdul use their own independently produced work to empower, educate and impact their audiences about the realities, both hopeful and heartrending, that many refugees face. Their ambition and subsequent success has taken the duo many places. Amina and Abdul’s film It has Killed My Mother has won several festival awards including: best picture, best screenplay and best actress, and best emerging filmmaker at the IOM Global Migration Film Festival in Geneva. In June 2018, Amina took the stage at TEDx Kakuma Camp, the first TEDx event hosted in a refugee camp, with refugees, and for refugees (watch her full talk here). This January 2019, Abdul traveled to Davos for the World Economic Forum, as part of the media team of videographers, to document the yearly gathering that brings together leaders of global society. The episode also follows Mercy Akuot, a talented musician, outspoken activist and refugee from South Sudan. In 2017, Mercy’s outstanding voice and stage presence drew the attention of FilmAid and the renowned Kenyan R&B and reggae producer Wyre. This lead to the launch of the FilmAid project ‘Finding A Star’, a talent scouting programme promoting youth economic empowerment through video and music. The project resulted in the production of the music album From Kakuma to the World and several music videos, one of them being the Sukar. Like Amina, Mercy was also selected as a TEDx Kakuma Camp speaker where she shared her grueling story of being married off to an uncle as a teenager (watch the full talk here). While the episode aired on CNN International last December, we are now excited to finally share the full episode with you! 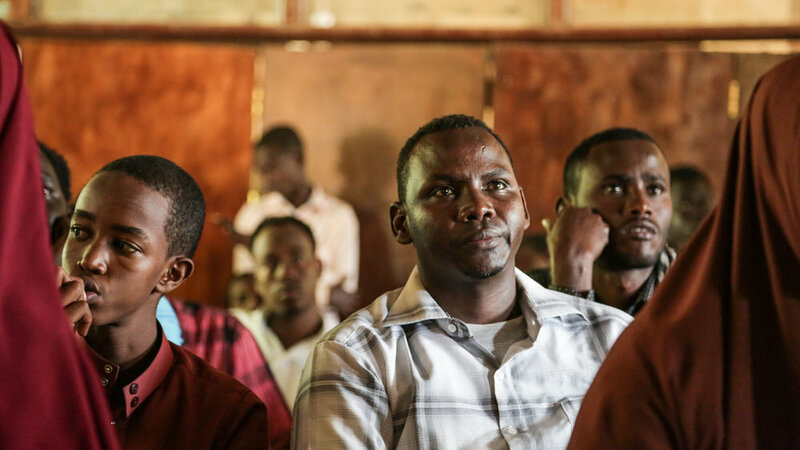 Over a dozen graduates of FilmAid’s Media Training program have recently returned home to Somalia after more than 20 years living in Dadaab Refugee Camp. These incredible young people are leading the efforts to construct a free press and to bring life-saving, actionable information to the members of their community who need it most. Maria Noor Ahmed is a 2016 FilmAid graduate, award winning video editor, and accomplished radio presenter and journalist. Maria is currently working as a journalist and on-air presenter for Jubaland TV, and is the Gender Coordinator for Give Hope Somalia, where she works to ensure that women’s rights are at the core of every project they implement for their UN and government partners in Somalia. Ali Hussein Sahal is the Director of Communication for the Ministry of Information in Jubaland, a semi-autonomous province in Somalia. A 2010 FilmAid Media Training Graduate, Ali has returned to Somalia to help rebuild the free press. He worked as the Chief Editor of Jubaland TV before joining the government to ensure that citizens receive accurate and actionable information, and that the government is responsive to inquiries and oversight by the local, national and international press. Abdulahi Mire is a 2011 FilmAid graduate and freelance journalist currently completing a university degree in Nairobi. Mire’s writing and reporting has been featured in the Washington Post, Al Jazeera, CNN and other leading publications. He is also spearheading an all-volunteer initiative to gather donated books for school-aged children in Dadaab Refugee Camp who are forced to share one text book with 100 other classmates. Help provide Refugee youth with the skills and confidence they need to speak up, speak out, and be heard. In 2010 Moulid co-founded FilmAid’s Refugee Magazine in Dadaab Refugee camp. After working as a humanitarian journalist in Somalia and completing a Master’s Degree in London, he returned to Dadaab to educate and inspire FilmAid Kenya Media Training students. Dadaab has a special place in my heart, it is the only home I knew for most of my teenage life after fleeing conflict in Somalia at a young age. It is where I grew up, went to school and established myself as a humanitarian journalist. I was about ten years old when we first came to the camps and settled in Ifo. My early memory of Dadaab is filled with isolation and despair. However, behind the misery lay a dream so powerful that no hardship could ever stop it. It is this hope that kept me going. I had a passion for journalism and I have always wanted to be a journalist, ever since high school. After completing my secondary education, I joined FilmAid’s media training program in 2010 where I co-founded the first Refugee Magazine in Dadaab. The magazine was a breakthrough for youth like me in the camp who wanted to be champions in our community. Coming back to Dadaab to work with FilmAid media students this summer to inspire and share my skills and experiences with them is really exciting. The new students I met are simply amazing. I can see myself in their eyes, eager to grasp new knowledge, asking me questions about how I started the first refugee Magazine in Dadaab, how that helped me build confidence to write for international media organisations and how I got a job in Somalia. I am privileged to be in a position to answer these questions as I, very much, relate to the students. For me to come back and share real life experience is extremely powerful. I could see the glimmer of hope and the feeling of ‘we too can make it’ in their faces. Dadaab seems to have been forgotten with the world’s attention consumed by the growing refugee crises elsewhere in the world, such as Syria and South Sudan. Many aid agencies have either scaled down services in Dadaab or withdrawn because of limited funding. This means that the current class of students could not publish the Magazine regularly. The facilities and training equipment are not sufficient, but they still continue to utilise the little they have to pursue their dreams. Refugees need to thrive, not just survive. Imagine being confined in a camp for a quarter of a century just waiting for handouts to stay alive. We need to support them and prepare them for the future. They want to gain skills to build their capacity and stand on their own feet. Amina is refugee from Congo who speaks English as her fourth language. Below is her story in her own words. My role model is a Kenyan Actress Lupita Nyong’o. In 2014, when she won her Oscar she said, “No matter where you are from your dreams are valid.” Those words spoke straight into my heart. I heard them here in the camp. I was born in DRC. But because of the war and violence, I was forced to run away. I only have painful memories. I have lost my whole family. I prefer not to talk about it. I came here in 2009. [At first] I got a job as a caseworker. I was helping women who went through sexual and gender based violence. They could share their story with me. I could share my own story with them. We could understand each other better because I am a survivor too. I wanted to do more to help them, but I did not know how. [Then, one day] I saw an advertisement that FilmAid was looking for young people who were willing to join their film training. I had my answer. This was how I was going to help those women I met. I had so many stories that I wanted to tell the world. I believed film could change people’s lives. I trained for one year. I worked REALLY hard. At the end, I won best director in the class. I was so proud of me. I had faced my fear. I had made a film. I had found my voice. I made a decision. THIS is my calling. It is my passion. I wanted my voice and the voices of other refugees to be heard. The next film I made was about FGM (Female Genital Mutilation). It is called IT HAS KILLED MY MOTHER. It has won international awards. I was interviewed on TV. My story was published in the newspaper. It was unbelievable. And now I am establishing my own production company called Exile Key Film. My message to my fellow refugees and young women is: Don’t wait for tomorrow. Use every opportunity that you have. And never, ever, give up. Your dreams are valid too. I was six years old when I and my family had to leave our home in Kosovo and become refugees in Macedonia. The image I have in my memory is of my mom, sad and depressed, holding my hand, and my dad holding my 2 year-old brother in his arms. My mom was 26 then, the same age I am now. When we were sent to the camp in Macedonia, people were silent and no one spoke about the terror that had just happened. There were many people, but I was feeling lonely and sad. I missed my toys and my friends, I missed having someone who could smile at me, and all I was seeing was sad and desperate faces. Then something magical happened. Someone came to the camp with cartoons and Charlie Chaplin movies, and for a while, there was a feeling that things will be alright, a feeling that I wasn’t alone. For a while I was happy, and the entire trauma that we went through went away. It was just me and the characters in the film. I only recently discovered that the organization who brought those films was FilmAid, and I wanted to tell FilmAid’s supporters how important that was for me. Growing up, that experience had an enormous impact on my life. I knew and felt the power of film to change people’s lives and to heal wounds that nothing else can heal. It was this magic in those times of terror that made me want to become a film director. I now make films about the struggles of women in Kosovo, and I am about to go into production on my first feature about the relationship between a daughter and her father who is afraid of losing his memory of her because of Alzheimer’s. It is a story based on my experiences in the camp in Macedonia with my grandpa, who would take me to see FilmAid’s movies and goof and imitate the characters for me, and who had Alzheimer’s at the time. I am thankful for everyone who is working in different parts of the world to help people, especially those organizations like FilmAid who bring that sparkle, that magic that I needed so desperately at that time, and that every child deserves. Help bring “that sparkle, that magic” to more refugees struggling not just to survive, but to prosper and contribute. FilmAid Kenya is producing three short films about access to quality education in Northern Kenya, an area that continues to exhibit extensively lower participation and completion rates, particularly for girls. Chore Burden – A fictional short film about how girls attending school in Turkana and Dadaab are often unable to complete homework due to the burden of household chores, while boys are left to do their homework and take part in recreational activities. Economic value of educating girls – A short fictional film that explores the positive effects and economic return of investing in educating girls. Men and boy promoters of girl education – A short documentary film showcasing a number of testimonials by influential men who support girls’ education with the aim of challenging opinions which hamper access of education for girls. Following the completion of the films, these powerful stories will be shared with Kenyan and refugee communities through film-based workshops, mobile evening screenings and SMS outreach. The communications campaign will aim to creating spaces where new skills are acquired and dialogue where existing attitudes and practices around equity in education are questioned. The films are being produced and distributed in partnership with the World University Service of Canada (WUSC-EUMC) and Windle International Kenya. FilmAid Kenya is implementing an innovative social marketing project on the benefits of Voluntary Medical Male Circumcision (VMMC) in 24 locations around Turkana County, Kenya. The project is providing information on VMMC to communities directly, through interactive face–to-face dialogue initiated by the screening of the short FilmAid produced film ‘Heroic Cut’. Video initiated dialogue is being complemented with radio and public address announcement and mini road shows. VMMC is an effective biomedical intervention that has been proven to reduce the risk of female-to-male HIV transmission by up to 60 percent. The Turkana community is traditionally do not practice circumcision and uptake by men 25-29 years has been generally low. This project is funded by Population Services Kenya and supported by AMREF Kenya, Nyanza Reproductive Health, Kakuma Mission Hospital, the Catholic Church, AIC Mission and Turkana County Health Ministry. FilmAid staff Moses Epem facilitates a mobile screening at a hall in Lowarengak settlement, Turkana. At FilmAid we believe that when people speak up and are heard, their experience, their existence, and their demands can no longer be ignored. In this newsletter you'll learn about the different ways that FilmAid, with your support, has been making an impact in the lives of refugees. Through media training, life-saving information campaigns, film-based workshops, and by engaging the community in its own development, FilmAid is working to build community resilience and expand opportunities for youth in two of the world's largest refugee camps. But first, we need to tell you about the first TEDx in a refugee camp and FilmAid's role in celebrating the creativity and contributions of refugees. Two young women from FilmAid's programs recently stood up on the world stage to tell their own stories at the first ever TEDx in a refugee camp. Follow the links below to listen to Aminah and Mercy tell their stories of struggle, survival and self-determination. "I faced my fear. I made a film. I found my voice... This is my calling. It is my passion. I want my voice and the voice of other refugees to be heard." Aminah Rwimo is an award winning short filmmaker, winner of the Best Director prize at the 2015 FilmAid Film Festival, and is currently working as a film training assistant at FilmAid Kenya. Aminah fled the Democratic Republic of Congo in 2009 after losing her entire family to violence. Aminah identifies herself as a survivor of sexual and gender based violence, and has chosen to use her filmmaking talent to tell the stories of other young women whose lives are too often destroyed by the violence of more powerful men. "Alongside my work fighting for women, I’m also pursuing my dream as a singer. I want my music to bring hope and joy." Akuot Mercy Marang was one of two musical artists who was chosen under FilmAid's Finding a Star project done in collaboration with hip hop producer Wyre. Finding a Star helped Mercy launch her professional music career, and gave her a platform to push back against negative stereotypes about refugees in Kenya. At 15 Mercy was forced into marriage to a violent 56 year old man. She finally escaped from Uganda to Kenya along her own personally constructed Underground Railroad. Her courage is what led her to the safety in Kakuma Refugee Camp. And it is her continued courage in fighting to end forced marriage that provides hope for other girls, everyone of whom has a right to pursue her dreams free from sexual violence. Aminah’s Speech starts at 25:00. Skip ahead to see Mercy’s speech which starts at 3:42:00. FilmAid livestreamed TEDxKakumaCamp in its entirety in six locations in Kakuma Refugee Camp and four locations in the Dadaab Refugee Complex, ensuring that community members could experience the event live, as it unfolds. When personal stories reach a mass audience individual ripples can turn into waves. The same thing occurs within individuals, families and communities when people lead by example, work through consensus, and speak out on behalf of those less powerful. FilmAid's impact at the community level can only be glimpsed through the numbers. But behind every campaign, every short film, every theater performance and radio show there are individuals from the communities we serve using their stories, their skills and their ambition to make change in their own lives and within their own communities. Continue reading to find out how FilmAid's Media Training and Skills Development combines with our Life-saving Information Campaigns and intensive Film-based Workshops to foster resilience and the ability of individuals and the community at large to advocate for its needs and the needs of most vulnerable. Every year FilmAid conducts a year-long Media Arts Training Program where students like Aminah learn the fundamentals of filmmaking and journalism. This year, 120 students took part in our program, a 40 person increase in enrollement over last year. Also this year, FilmAid has begun conducting its first Master Class in Kakuma Refugee Camp where media arts students who’ve finished their first year can continue to refine and professionalize their filmmaking skills. Of the 80 who completed the first year course in Kakuma, 50 have signed up for the Master Class. FilmAid also conducts Theater Trainings that harness the skills of refugee youth to support social marketing projects promoting community well-being. Over 100 youth have taken part in our Community Theater Training. FilmAid's Kenya staff building their skills and their team spirit. FilmAid hosts yearly Community Outreach Trainings where FilmAid's national and refugee staff learn a range of vital work and leadership skills. So far in 2018, over 70 staff members from the refugee community have participated in our Community Outreach Training. FilmAid conducting registrations for its Bulk SMS Messaging Service for Refugees in Kakuma. One of FilmAid’s core functions is to develop and distribute life-saving information. Every single day FilmAid's over 130 staff are in the communities sharing information about the recognition and prevention of often deadly diseases like cholera, HIV, and malaria. Additionally, we ensure that refugees know their rights and are able to leverage those rights to access all of the camp's services from health to education to economic opportunity. Over the past year FilmAid's campaigns have used a multi-platform distribution strategy that leverages channels FilmAid itself developed and maintains. Our approach ensures that the right message reaches the right person at the right time. FilmAid sent 19 emergency alerts through its own SMS network reaching 37,000 households in both Dadaab and Kakuma who subscribe to our service. FilmAid distributed 130 separate announcements using loud speaker trucks broadcasting critical information in 6 languages and reaching on average 70% of the camps’ populated areas. FilmAid held 140 Film-based events reaching 153,000 people. FilmAid's in-person events are a platform for delivering reliable, life-saving information on topics like how to prepare for and deal with flooding, how to protect sources of clean drinking water, and how to protect children and the elderly during cholera outbreaks. In an crisis, having good information can be the the difference between life and death, and we take our responsibility to provide quality information as quickly as possible very seriously. FilmAid Workshop in Dadaab Refugee Camp. Film-based workshops are our most effective means for helping translate our communities’ knowledge of their human rights into action. We’ve led workshops on topics spanning from sexual gender based violence and girls’ education, to food preparedness and cholera prevention, and those who participate in our workshops leave equipped with the knowledge to take advantage of their rights and incorporate healthier practices into their day-to-day lives. Over the last year, 686 film-based dialogue sessions conducted have led to 20,477 exposures or face-to-face interactions with community members. Each of these was led with the express purpose of teaching habits and practices that promote healthier physical and social lives. Notably, 59% of our workshops’ participants were female, and this is important to us because although our workshops touch on a range of themes, we are especially interested in empowering women and girls. Through workshop series like Girls First and Women in Health and Leadership, we seek to give women and girls the knowledge to be advocates for their rights. Women in the camps are particularly vulnerable, and we help them become strong and resilient. FilmAid is also known for its mobile cinema screenings. Events that bring family films to the camps and provide welcome psycho-social relief. Since September we have organized 139 screenings for refugees’ entertainment, including films like Air Bud, Mickey Mouse and Tom & Jerry. We also screened pan-African favorites like A Piece of Land, Yellow Card and Whom Do I Turn To. FilmAid is proud to make two exciting announcements about TEDxKakumaCamp, the first TEDx event ever held in a refugee camp. The theme is “Thrive, a celebration of the resilience, creativity and contribution of refugees.” We are thrilled to be a part of TEDxKakumaCamp and further our core belief that a community that speaks for itself is a community that can change and heal itself. FilmAid will live stream the first ever TEDx event in a refugee camp on June 9 at 10AM (GMT+3), in 10 locations, six in Kakuma Refugee Camp and four in the Dadaab Refugee Complex. two beneficiaries of FILMAID media training programs will take the stage as featured speakers. Aminah Rwimo, 24, is a 2015 FilmAid Media Training alumnus, and a refugee from the Democratic Republic of Congo. After completing FilmAid’s year-long media training course, Aminah launched her own career as a successful filmmaker. Her films have won numerous film festival awards including: best picture, best screenplay, best actress, and most recently Aminah herself won an award for Best Emerging Filmmaker at the IOM Global Migration Film Festival in Geneva for her film “It Has Killed My Mother.” Aminah is currently a FilmAid Media Training assistant teaching over 50 students how to use film to tell their own stories, and advocate for their own needs. Aminah is also hard at work on her second short film script and has founded an independent production company in Kakuma called Exile Key Films. Akuot Mercy Mareng is a talented musician, outspoken advocate and refugee from South Sudan. In 2017, while on stage in Kakuma performing at a World Refugee Day event, Mercy’s outstanding voice and stage presence drew the attention of FilmAid as well as Kenyan hip hop producers Wyre the Lovechild and Jua Cali. A short while later FilmAid teamed up with Wrye to launch the Finding a Star initiative which is supported by the US State Department’s Bureau of Populations, Refugees and Migration. Mercy’s single "Anavonifanya" was produced and released as part of Finding a Star. FilmAid’s students helped produce a highly successful PR campaign that has helped catapult Mercy into the national spotlight in Kenya with appearances on TV and features in the leading national newspapers. Mercy will be speaking about her experience of forced marriage and her passionate commitment to using her music to advocate for the rights of women and girls. 250 high-profile guests from around the world will descend on Kakuma to attend the event in person. An additional 5500 refugees in Kakuma and Dadaab Refugee Camps will be able to watch the event live through large screenings hosted by FilmAid and other agencies. We are excited to provide large-scale screenings of TEDxKakumaCamp in Dadaab and Kakuma Refugee Camp so the refugee and host community can be inspired by the creativity, courage and contributions of the speakers, especially the four young refugees who will tell their own stories. FilmAid documentary about the diversity and creativity of the Kakuma Community. Made possible with support from DFID and UKaid. Choose to inspire. And be inspired in return. This holiday season, FilmAid invites you to be inspired by the optimism and defiant determination of refugees using film and other media to lift up their own communities. Be inspired by the creativity of FilmAid's 120 students and 140+ refugee and local staff who bring life-saving information, psycho-social support and much needed hope to their own communities every day. Be inspired to support young refugees like Sarah in the video below who uses film in her fight for girls' education and an end to discrimination. Be inspired by FilmAid's over 10,000 Mobile Cinema Screenings and 1000s of Film-based workshops delivering critical information about human rights, public health, economic opportunity and conflict resolution. Be inspired by FilmAid’s campaigns to end discrimination against refugees through national TV broadcasts in Kenya, public relations campaigns, and high profile events celebrating the creative contributions of refugee youth, especially women, girls, the elderly and disabled. Give the gift of inspiration this year, and be inspired in return And stay tuned for more stories of FilmAid students and staff inspiring their communities to continue to fight for peace, justice and future filled with hope.